I opened NW on Friday night and immediately became submerged in this part of London that I’ve never been too. I closed and finished it late Sunday night. My reading was supported by the excellent Penguin audiobook. 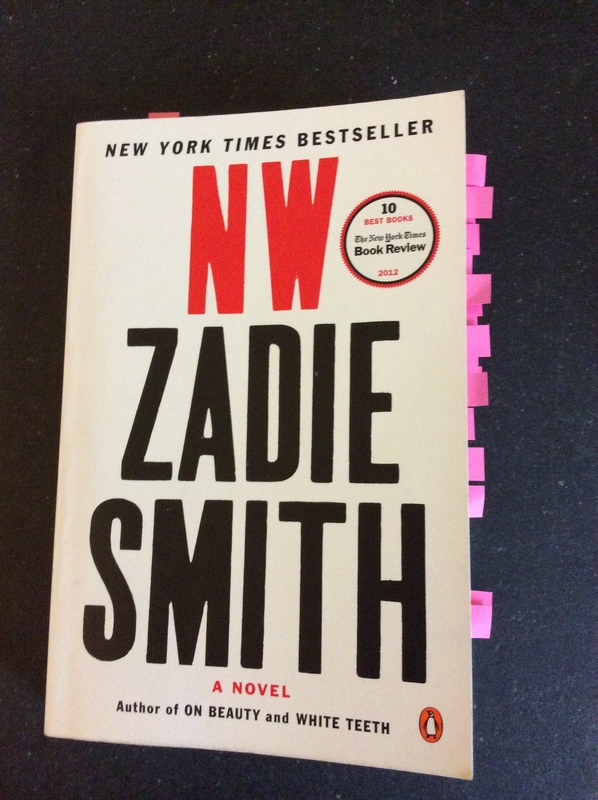 The two first-rate audiobook readers added to the tremendous life that Zadie Smith put into writing NW. Each accent gave me that perspective I needed to relate to the characters but most of all to give me the right tone. The tone that I imagine Zadie Smith was imaging when she wrote NW. I found myself comfortably reading and merging into this complex story – “the story of guests and hosts and everybody in between” (back cover of NW, Penguin edition). Uncomfortable. Challenging. Shocking. Colorful. Sincere. Brutal. NW packs the punch that maybe some aren’t ready to read. NW is the story of two girls, Kesha and Leah, that have grown up together and been close friends for a long time. One is white and the other is black. We follow them as young girls who become successful young women. Their starting point is NW. NW is their shame, their fond memories, their family, their friends,…. It isn’t far from shopping on the High Street, sightseeing on double-decker buses, and lounging in Hyde Park. However, it seems to be a place that is important to both characters since it is the place they grew up, their focal point, and it is part of who they are, no matter how much they try to hide it. The novel is split into 5 parts. Each part tells the story of inhabitants of NW who may or may not be directly connected to the main characters. The majority of the second half of the book is a series of short sections that are numbered from 1-185. What is important is the feeling and ambiance that you’ll get as the story continues. Contemporary in structure, this sort of stream-of-consciousness writing is captivating and spirited. It will keep you hooked. At times, it made me laugh aloud. Nothing really happens in NW because it is a character driven novel. Don’t go into reading this thinking it’s just a typical plot that moves from A to Z. It’s more than that and you’re going to have to work to enjoy and to understand the importance of it. Imagine trying to piece together a puzzle. However, everything fits together in the end. I highly recommend the audiobook, which is extremely helpful with the different accents. Being American I would have had difficulty imaging them all in my head correctly. Really, that audiobook made a significant difference. The writing is continuous speaking, with scattered dialogue here and there. It’s the first time I’ve enjoyed stream-of-consciousness writing. I can’t explain it but for me it made sense. The mosaic of characters, incidents, and life happenings made the story tangible, until I got to the end. Sure life is abrupt, but the ending lacked a serious amount of reality. That was the only thing that really bothered me. I read somewhere that Smith was taking care of her young daughter when she was working on NW so wrote in chunks which is probably what gave birth to the numbered sections in the second half of NW. All the same, I’m impressed with Smith’s capacity to capture the authenticity of each of her characters no matter how minor they are in dialogue. It’s brilliant. I could even imagine what each character might look like even though there weren’t necessarily descriptions. Dialogue is so important and she is the “Queen of Dialogue”. Having read White Teeth and The Embassy of Cambodia (loved them both), I read On Beauty and didn’t like it very much. I wasn’t really sure what to expect with NW. Well it’s really good, however a challenging read it is well worth it. I’m rating this one 4,5 stars. I have to say I’ve fallen in love with Smith’s writing again. The next Zadie Smith’s I’d like to read is Changing My Mind: Occasional Essays and The Autograph Man (nobody ever mentions it). I read NW months ago, it is a book I like, but I feel like I have to read it again to appreciate it a little more. I read On Beauty first and for some odd reason I loved it. NW was kind of odd for me and if you are familiar with David Foster Wallace, you would probably know that her writing is influenced by him. I read the first twenty pages of Infinite Jest just to try it and I have to say NW is definitely her DFW book. The whole experimental style of it was very DFW esque. I’m headphonegirll11 and my blog isn’t wordpress. So I have commented in different names, mostly my real one I think. Well i’m sure you’re right. I haven’t picked up any DFW yet. Hello headphonegirl11! Even so I think it’s done really well. I strongly urge you to get the audiobook and read along with it. It’s brilliant! It definitely doesn’t merit all the bad reviews it’s been getting. Thanks for commenting over here. Do you blog? if so where? I blog at Blogger. I blog about books too, not a Youtube channel, I don’t have the guts for that. Once in awhile your blog appears on my feed, but when I saw the NW I was just like “Dude, I read that like months ago, I wonder what she thinks of it.” So I’m glad to know other people enjoy it, because on Goodreads it’s pretty mixed. Mostly negative in my perspective, but I liked it, but not as much as On Beauty. Hmm, I think your review might have convinced me to give Zadie Smith a try. I’ve wanted to for a while, but to be honest I didn’t know which book would be the best to pick up. A friend of mine didn’t like On Beauty much at all, but maybe I’ll start with NW. Thanks for sharing your thoughts! Thanks, I found that people who didn’t enjoy it were people who didn’t really like or read that type of literature. I think Zadie Smith has such a range of readers that many pick up her work expecting it to follow a more traditional storytelling narrative, but her work is multi-layered and has become more so with each novel. This book was a courageous accomplishment and worth persevering. I love how she managed to change the pace and tone of the narrative with each character, as if it were a metaphor for their state of mind, Leah’s thoughts are all over the place and the narrative is staccator like, disjointed, jumping from one thing to another, whereas Felix has moved on, he is past his reckless stage and has things kind of sorted, the narrative is easier to read and the pace picks up. Loved Theodora Lewis-Lane even though she doesn’t play a major role, I wish she’d given her more of a place in their lives, even if she was maybe something of a cliche, but she offered great storytelling potential.